Healty for your body. Healty for the planet. 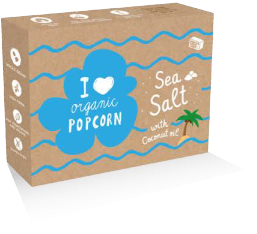 Our popcorn contains organic coconut oil. No palm or other hydrogenated oils. Huge areas of tropical forests are being cleared to make way for palm oil plantations, contributing to global warming by releasing carbon into atmosphere and also destroying the habitats of orangutans, tigers,rhinoceroses, and elephants. We use european organic corn to prevent any possible GMO contamination. We grow popcorn where GMO crops are forbidden by law. Popcorn is whole grain, gluten free and rich in fibre.